Carrots are making a comeback. OK, so I don’t know that carrots actually ever went anywhere, but I’m finding that basically every beauty product I try that has carrot seed oil in it is an immediate match for my skin. And that’s what drew me to Jacq’s Organics Carrot Con Leche Face Serum. Carrot seed oil is rich in beta-carotene as well as vitamins A and E. It helps to heal chapped skin while also balancing the moisture in skin — no greasy overload here! 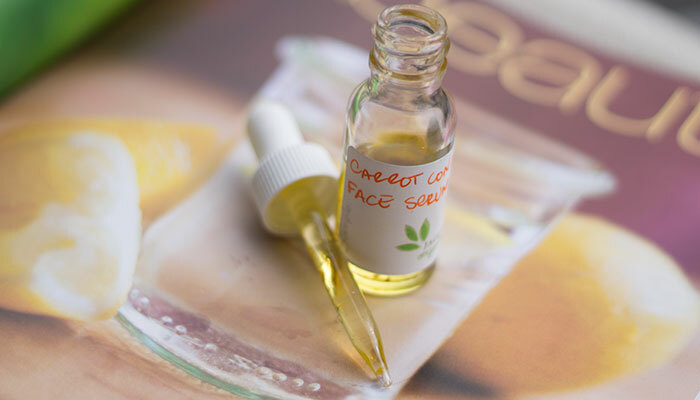 Carrot seed oil is also said to help remove toxic buildup in the skin and diminish the appearance of scars. It’s no wonder it’s such an appealing oil to those of us with blemished, angry skin! I sought out Jacq’s Organics Carrot Con Leche Face Serum via the blemished and oily skin section of the shop and can’t tell you how refreshing it was to see something besides tea tree oil in the lineup for problem skin. 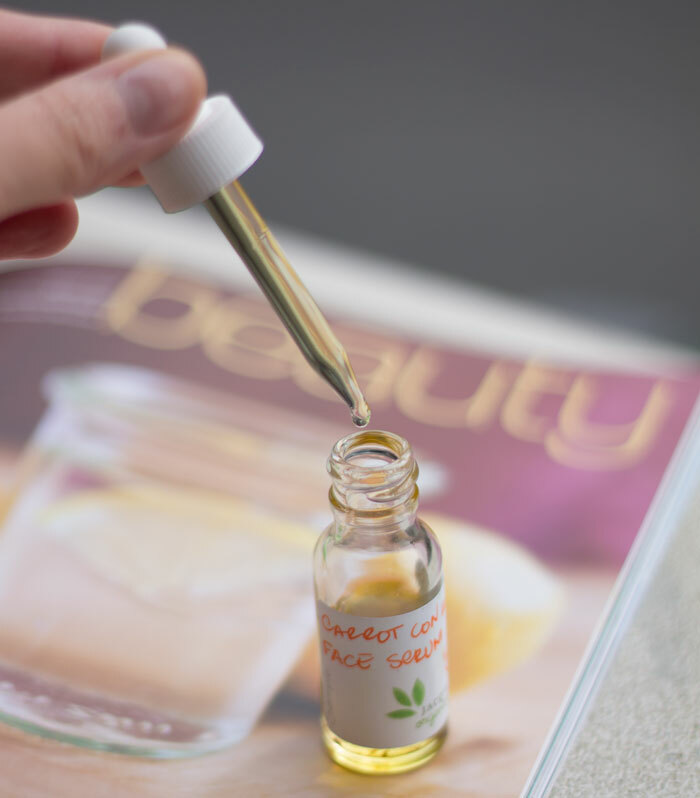 A further look down the ingredients list revealed a beautiful combination of some of my favorite oils that offer a slew of vitamins and light moisture to the skin. Prunus Armeniaca (Apricot) Kernel Oil, Daucus Carota Sativa (Carrot) Seed Oil, Rosa Canina Fruit Oil, Prunus Amygdalus Dulcis (Sweet Almond) Oil, Aloe Barbadensis Extract, Camellia Sinensis (Green tea) Leaf Extract, Cucurbita Pepo (Pumpkin) Seed Oil, Calendula officinalis CO2 extract, Hippophae rhamnoides (Sea Buckthorn Berry) CO2 extract and GMO-Free Vitamin E.
Anytime you can get carrot, camellia, pumpkin AND sea buckthorn into an oil at an incredibly affordable price ($28!) is just mind-blowing and skin/money-saving. 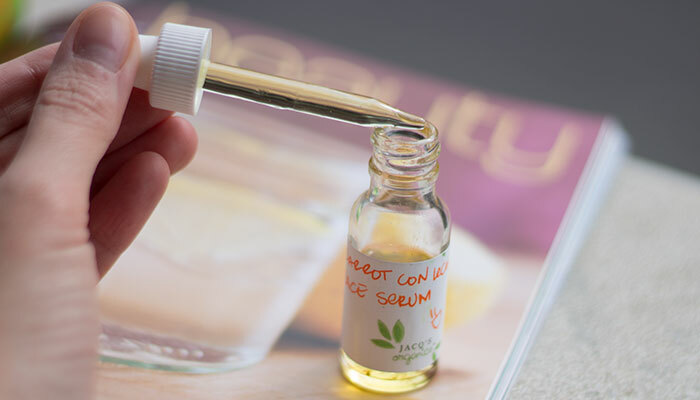 I used Jacq’s Organics Carrot Con Leche Face Serum as my daytime face oil for about three weeks (until my small sample size was finished!) and found myself excited to reach for it every morning. That’s saying a lot because it’s very difficult to stick to just one oil for several weeks of testing when there’s so many options and you have your old favorites right there begging for attention. 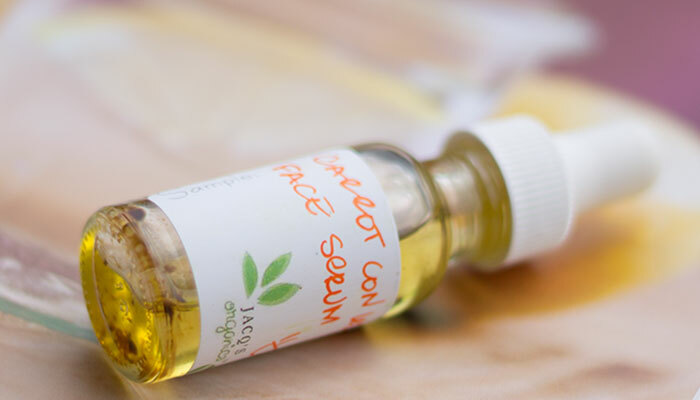 The extremely lightweight texture makes Jacq’s Organics Carrot Con Leche Face Serum a stellar pick for those with very oily skin. On some days, I found myself adding a little extra oil or a light layer of shea over my face to get a bit more moisture (I’m oily but have a few dry spots). As the weather gets warmer and my skin becomes dewier naturally (read: sweaty and oily mess), I think Jacq’s Organics Carrot Con Leche Face Serum will be a go-to for that subtle touch of moisture. Besides the almost-perfect weight of Jacq’s Organics Carrot Con Leche Face Serum, I was totally taken with the scent of this oil. It was extremely subtle and fresh like morning dew. Imagine the smell of a springtime sunrise — that’s this. Dainty, fresh and clean. After a description like that, I’d be insane NOT to put Jacq’s Organics Carrot Con Leche Face Serum on my repurchase list. With summer just around the corner, this is bound to be my go-to oil for my summer sunrises. Have you tried anything from Jacq’s Organics? What face oil ingredients are you drawn to? Tell me in the comments section!